Laparoscopic left hemihepatectomy using the Glissonian approach is technically challenging secondary to a thick Glissonian pedicle and limited maneuverability of laparoscopic instruments. This procedure demands extreme caution owing to the high risk of bile leakage associated with left hemihepatectomy. We describe the technical details and surgical outcomes of the intrahepatic Glissonian approach to the ventral aspect of the Arantius ligament in laparoscopic left hemihepatectomy. After detachment of the left side of hilar plate, the meticulous dissection was performed in the liver capsule above the left Glissonian pedicle. Dissection of the ventral aspect of the Arantius ligament creates the space between the liver parenchyma and the left Glissonian pedicle. The left Glissonian pedicle was isolated and encircled using the long curved laparoscopic instrument. During the parenchymal transection, the left Glissonian pedicle was transected using lateral to the Arantius ligament. Between February 2013 and July 2018, 13 consecutive patients underwent pure laparoscopic left hemihepatectomy. The median operation time was 230 min (range 180–300 min), and the median estimated blood loss was 300 mL (range 100–600 mL). Two patients (15%) required transfusion. The median tumor size was 40 mm (range 10–105 mm). All patients showed negative resection margins. The median postoperative hospital stay was 8 days (range 6–15 days). Major postoperative complications occurred in 1 patient (7.7%). No perioperative deaths occurred. 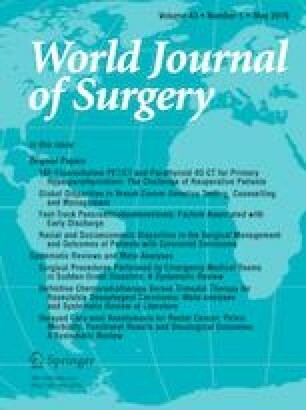 An intrahepatic Glissonian approach to the ventral aspect of the Arantius ligament is a feasible and effective technique in laparoscopic left hemihepatectomy. The online version of this article ( https://doi.org/10.1007/s00268-019-04907-1) contains supplementary material, which is available to authorized users.